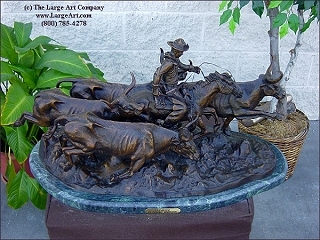 The Stampede was Remington's last sculpture, the model completed in late 1909 just before the artist was struck with appendicitis. Remington died in December of that year, before the first cast was made. The finishing touches to the group were completed by Sally Farnham, Remington's friend who was also an artist. The original size is a big piece of sculpture and perfect for a centerpiece for a large home or commercial space. The small or mini sizes are more appropriate for most homes.